WORKSOP Table Tennis League round-up. 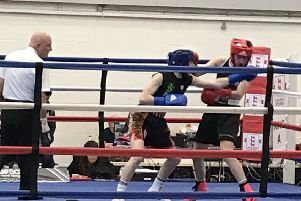 Tom McIntosh and Pete Hodgson both had a successful day at the Worksop and District Annual Championships which were held at Sparken Hill Academy. McIntosh amazingly managed to reach five finals out of the six competitions he entered albeit one of them, the Cadet Singles he didn’t have to play a shot getting a bye from the semi final straight into the final where he will play Martynas Riauba who beat his twin brother Orestas 3-2 in the one semi final match that took place. McIntosh also reached the final of the Junior Singles after dispatching Lee Banton and then Martynas Riauba without dropping a set. He will play Orestas Riauba in the final after he came through against Adam Hamilton and his brother Martynas in the semi final. McIntosh will be hot favourite to win both the Cadet and Junior Singles finals when they are played later in the season but the other three finals he has managed to reach will be less straightforward. McIntosh who reached the final of the Open Singles last year repeated that feat again and enjoyed a trouble free run to the final with straight sets wins over Neil Fisher, Pete Hodgson, Malcolm Manuel and Kalpesh Bhatt in the semi final. He will meet Ernest Mpundu who had made short work of all his opponents up until the semi final where he came up against Richard Element who is the current Open Singles Champion and their match was by far the Match Of The Day. Both players were treating the people watching to some incredible attacking table tennis with Mpundu taking the first two game before Element hit back to level the contest at 2-2 before Mpundu juts managed to edge the deciding set 11-9 to make it through. Element made up for his disappointment of not making it though to the Open Singles final by once again making it through to the final of the Handicap Singles where in a repeat of last year’s final he will once again meet Tom McIntosh but the performance of the competition went to Ben Swain who knocked out Ernest Mpundu in the second round with Mpundu being one of the favourites to reach the final. Another surprise result came in the Open Doubles with the defending champions Richard Element and Dave Marsh of Division One going out in the quarter finals to Pete Hodgson and Nigel Stent from Division Two. The match was one of the best of the day with Hodgson and Stent deservingly going through by three sets to 1 but their amazing run came to halt in the semi finals as they narrowly lost 3-2 to Ernest Mpundu and Rick Harris who made it through to the final where they will meet McIntosh and Steve Johnson who overcame Kartik Lakhani and Andy Lee in their semi final. Pete Hodgson’s day was a long one as he was one in one of the first matches played at 9.00am and he was also in the last game to finish at 7.10pm. Hodgson had a great run in the Draw Doubles making it all the way to the final where he was joined by Richard Element, Kalpesh Bhatt and Ben Swain and when the draw for partners is made on the night of the final he will be hoping for a favourable draw. - Full table tennis report online at worksopguardian.co.uk/sport. Hodgson also enjoyed more success by reaching both the 2nd Division Singles and the 2nd Division Doubles finals. Hodgson partnered Nigel Stent in the doubles and made short work of defeating Clive Eden and Mark Bloomer in the quarter finals before beating Tony Swain and Jim Westwood in the semi final, they will meet Jeff Reay and Valentinas Riauba in the final who themselves had some good wins along the way, none more so than when they defeated Orestas and Martynas Riauba 3-1 in the semi final. Hodgson’s journey to the final of the 2nd Division Singles was made a little easier by having a bye in the second round before enjoying wins against Jeff Reay and Adam Hamilton. His opponent in the final will be Martynas Riauba who had some tricky looking opponents standing in his way but managed to negotiate his way past Clive Eden, Orestas Riauba and Nigel Stent along the way. Another surprise result came in the 3rd Division Singles as probably the favourite for the title Derek Piper went out to Neil Houghton who played some solid table tennis to get through against Piper and make it all the way to the final. His opponent in the final will be Chris Clemson who had a good win over Jonno Blood in the other semi and it will be a close encounter in the final. Clemson and Houghton will also meet in the final of the 3rd Division Doubles with their respective partners. Clemson and Derek Piper defeated Jack Tarr and Adam Pinches to reach the final whilst Houghton and Blood enjoyed a bye into the final due to another players injury. The Plate Singles competition for losers in the first round of the Open Singles threw up some interesting games with the final being between Helmuth Osborne and Steve Lyon who both surprisingly got knocked out in the first round of the Open Singles to players a division below them. Osborne lost to Mark Bloomer whilst Lyon was comfortably beaten by Martynas Riauba. Pete Hodgson rounded off the day’s proceedings by beating Kartik Lakhani in the semi final of the 40+ Singles and Lakhani was the third player from Division One that he’d beaten on the way to the final after knocking out both Malcolm Manuel and Steve Lyon. Hodgson will meet Ernest Mpundu in the final after he knocked out Clive Eden, Jim Westwood, Dave Marsh and Rick Harris. Reg Wilcox Trophy Results: DTH Redlands Monster 378, Manton Tigers 0 (Conceded), Worksop Miners Welfare ‘B’ 363 Stanley Street Cypriots 342, DTH Redlands X-Youth 474 Manton Sports 480. MBE Trophy Results: Stanley Street ‘E’ 378 DTH Redlands Liver Birds 0 (Match Awarded), Ryton Park Cougars 326 DTH Redlands Rookies 386, On-Line Elks 468 Ryton Park Falcons 488.